The stakes just keep getting higher and the battles keep getting more intense as the Semi-Finals of our Best Dungeon tournament rage on. 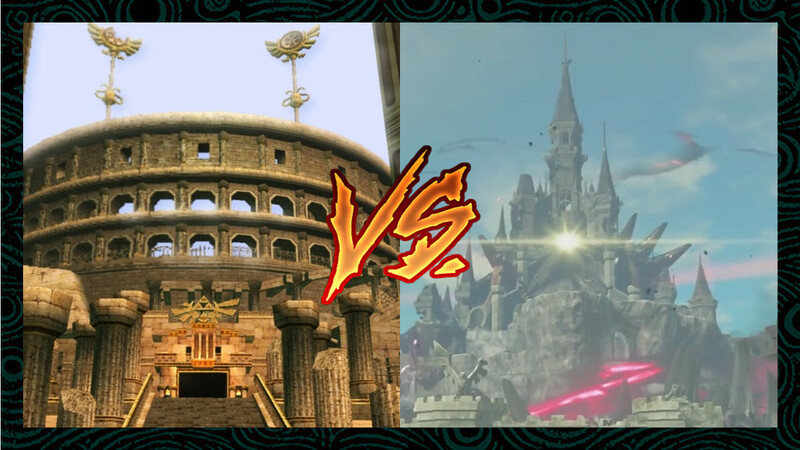 We saw two juggernauts go at it in Wednesday’s poll, as Stone Tower Temple clashed with Ancient Cistern, but today’s match-up tells an epic tale all its own. Join us as the haunted prison in the desert takes on the Calamity-striken citadel. The Arbiter’s Grounds have been a favorite to win the tournament from the very beginning. The dungeon’s theming, layout, design, enemy encounters, and significance to Twilight Princess‘ story helped propel it through some of the most intense bouts of the entire tournament. I don’t think many other dungeons would have toppled both Turtle Rock and the Spirit Temple, but the popularity of this ancient stronghold is undeniable. With so many people backing the Arbiter’s Grounds, we may just see it earn a spot in the Finals. In a Herculean tale for the ages, Breath of the Wild‘s Hyrule Castle has risen above overwhelming adversity, toppled several giants in its way, and cemented itself as one of the greatest dungeon of the Zelda series. Whether or not you believe it’s an “actual dungeon” at this point, you cannot deny the feats Hyrule Castle has achieved in this tournament so far. Today’s bout will be its biggest test, but this open-air behemoth has done more than enough to prove its prowess. We have a true Cinderella Story in the making if Hyrule Castle moves on to the Finals. Which is the Better Dungeon? If you receive a “Failed to Verify Referrer” message and you are logged in to a version of WordPress, try logging out. The Semi-Finals voting pages will post this Wednesday and Friday. Voting for each poll will be open for exactly one week. Once both voting pages for the Simal-Finals have been posted, there will be a one-week break before the Finals begin.